The Daily Press Readers’ Choice awards recognizes favorite local businesses throughout the newspaper’s readership. Hampton University out-ranked other peninsula colleges, including Christopher Newport University and the College of William and Mary. The Wall Street Journal/Times Higher Education ranked Hampton University as the top university in the Hampton Roads area. Last month, US News & World Report’s annual college rankings placed Hampton University third among HBCU’s as well as No. 14 for veterans and 21st among regional universities in the south. Money Magazine named Hampton University on its list of top colleges and universities. 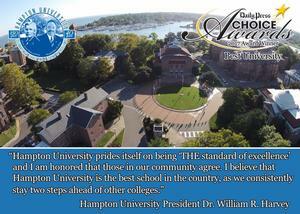 In The Princeton Review’s annual report on colleges, Hampton University was named a Best Regional College as well. Online College Plan named Hampton University a top-10 HBCU with online programs, and Affordable Colleges Online ranked Hampton University a top 5 online school in Virginia.